While not exhibiting a completely ovewhelming presence as yet, the evidence is piling up that social media is going to become fully integrated with our television viewing. 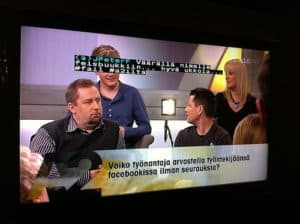 This photo of Finnish television reveals that the interest is global. For a lot of television viewers out there, connecting with television personalities like news reporters and anchors on Twitter – or at least the potential prospect of coming into contact with these people – is part of the fun of watching TV. It’s a new part of the fun of TV as well, considering just how relatively new social media is to the participation of viewers with TV. No longer do viewers have to focus on sending in fan letters or having their emails ignored. Now one well-placed and well-timed Tweet can get you on TV! This has proven to be an amazing motivator to viewers to pay attention and participate. Here is a video showing a Google TV Twitter demo. Also, according to the recent consumer survey conducted by Horowitz Associates young people expecially are inclined to fully immere themselves into a television experience when it is connected to social media with their friends and aquaintances online. Is this a good development? It is if you’re looking for a more interactive experience. Television show producers would love for their topics to trend on Twitter, and you would love to have your Tweet re-tweeted by someone famous. The situation is win-win. What is all this and how does it all work? Why Do News Shows Use Twitter So Much? If you’re a fan of the 24-hour news cycle, you know that a lot of network and cable news television shows want to get people to interact with them on social media. The question isn’t why this is the case, but rather why not? Admittedly, keeping track of Twitter pages is not going to make a news organization win a Pulitzer, but since so many networks want you to follow them on Twitter, something else must be going on. In fact, it is precisely a news organization’s ability to connect with its audience that makes them effective. Not only does it allow the news organization to keep tabs on what people are talking about – emerging trends, breaking news stories, etc. – but it gives the viewer a feeling of true participation that makes them feel attached to the show to some degree. Let’s face it: Twitter, like so many other types of social media, is here to stay. Not only do many celebrities use Twitter and Facebook, but even the President (or someone he hires) sends out tweets periodically. 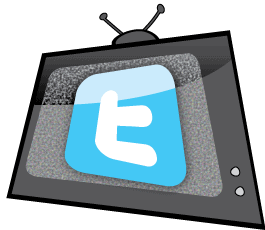 In a way, using Twitter can allow people to feel more connected to the world than simply watching television does. That’s not to say that television doesn’t have a place in the new media. But smart TV producers will continue to embrace social media as a platform to promote television shows the same way television produces in decades past might have encouraged viewership participation via letter or email. Participation is a good thing, because it helps create a buzz – it’s the buzz that helps create ratings. From the perspective of the viewer, it feels good to be pursued – even if it is just through a Tweet. Lanny Hayes, Marketing Manager at GoDish knows the power of social media, such as Facebook.